Of course these changes are not just about look, they allow the user to perform certain operations that the control itself does not support so we need to play with the code a little bit to add them. GridViews have properties to generate link columns to perform select, delete and edit operations like in the first picture of this tutorial but to give a more professional look to the control we might need to use self-designed icons like the ones used in the second picture. There are no simple properties to add columns with image buttons in them but when going to the markup language we can use other type of columns to achieve this, the "buttonfield" columns. Two things you have to notice on the first code line are the properties "AutoGenerateColumns" and "OnRowCommand". "AutoGenerateColumns" property has to be set to false in order for the image columns to work. 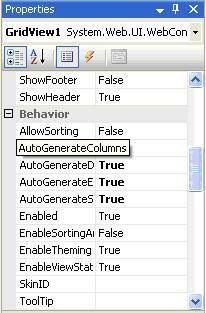 If the property is set to true, when databinding a data object, the GridView will create all the columns by itself erasing every column that could have been created in design. This property can be set to false at the properties tab in the design panel. "OnRowCommand" property will contain the name of the procedure that is going to handle the event thrown by the click of the image buttons. This can be set by double clicking the event in the events section at the properties tab in the design panel. Lines number 3 and 4 define the columns with the image buttons. The "ImageUrl" property will contain the path to the image icon we will use in the column. The "commandname" property will contain the name of the event that will help us differentiate between the click of one image button and another. For this example we have defined "ibtnEdit" as the name of the event that will be thrown when clicking an edit image button and "ibtnShow" as the name of the event for a show image button click. The "CommandName" property of the "GridViewCommandEventArgs" object (line 1) contains the name of the event that has been triggered. The "CommandArgument" property contains the index of the row where the image button was clicked (starting from 0 for the first row). Note that in the first line we set the "AutoGenerateColumns" property to false again. In line number 1 a CheckBox object has to be declared. A cycle to go through all the GridView rows has to be set so the checkbox of every row is verified. In line number 5 the FindControl method will allow us to get the Checkbox inside the specified row and the property Checked (line number 6) will give us a bool value that will tell us if the checkbox is checked (true) or not (false). 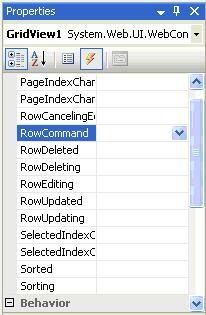 This will allow to add business code to process selected rows for example. The code above can be placed in any procedure or event inside the server side code of the webpage. An ArrayList object will be used to save the ID of each checkbox generated by the GridView. In line number 6 the checkbox of the header row is obtained using the FindControl method and its ID is the first value to be added to the ArrayList object. Note that every ID is added with Apostrophes. The method "ChangeCheckBoxState" will simply change the state of a Checkbox control to the value specified in the parameter checkstate. The method "ChangeAllCheckBoxStates" will set all checkboxes in the CheckBoxIDs arrayd variable to the value specified in the checkstate parameter. The method "ChangeHeaderState" will basically verify if all checkboxes are checked. If that's the case it will check the header's checkbox. That is verified when the method reaches the line number 14 which will mean that no checkbox was unchecked making the method to enter the if statement that unchecks the header's checkbox and finishes the method. Check / Uncheck operations can be easily implemented using server side code but we would have the expense of a postback that would end up annoying our customer for sure. Here is the sample code for this tutorial to appreciate the added functionalities.